often affordable, and more readily available. Choose firm, unblemished caps without mold or wet spots. Refrigerate in an open plastic bag or in original store package for up to 1 week. Wipe dirt off with a damp cloth. Cut off the end of the stem. Starting simple is a great way to try out a new vegetable, like mushrooms. Here are a couple easy ways to enjoy mushrooms. Add minced mushrooms to pasta sauce. Put sliced mushrooms on pizza as a topping. Preheat oven to 425°F. Spray 9x13 baking pan with cooking spray. In small bowl, whisk the roasting seasoning ingredients together. In a large bowl, combine potatoes, onions, mushrooms and carrots. Pour half of the roasting seasoning over the vegetables and toss to coat evenly. Spread vegetables in a single layer in the baking pan. Place the chicken in the bowl with the rest of the roasting seasoning. Toss to coat and place the chicken pieces over vegetables. 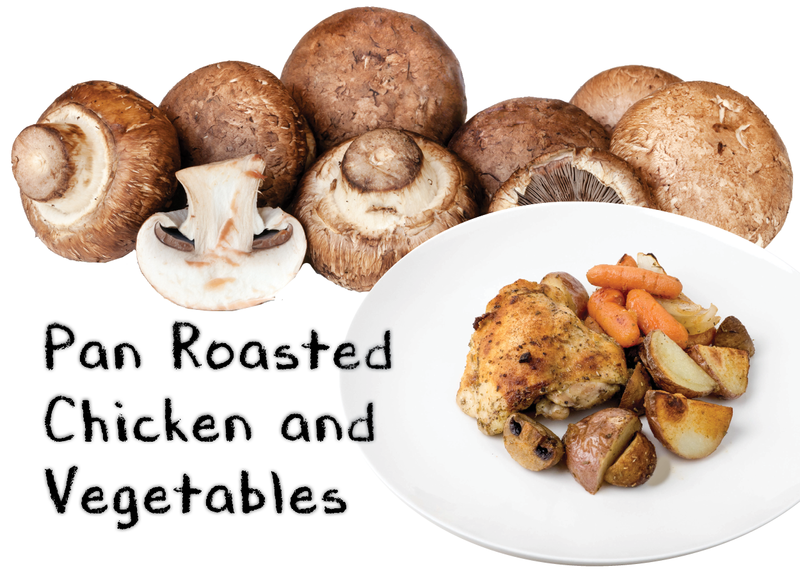 Roast the vegetables and chicken in the oven until a thermometer inserted in chicken reads 170°-175° and vegetables are just tender, about 40-45 minutes. 17g protein; 8g sugars; 35mg cholesterol; 720mg sodium. View our What’s In Season GUIDE for WINTER for a printable, 2-sided, complete list of fruits and vegetables in season plus shopping, storage, preparation, and start simple tips.